Our Abpromise guarantee covers the use of ab30350 in the following tested applications. 1/1 - 1/10. Use 10µl of the above dilution for 106 cells or 100ul whole blood. 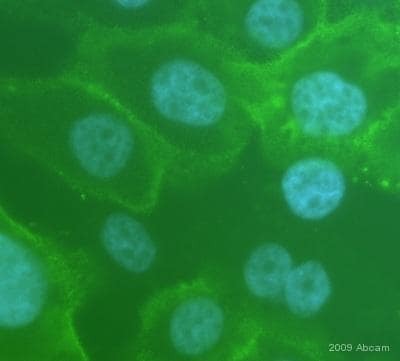 ab30350 staining CD24 in human pancreatic adenocarcinoma cells by ICC/IF (immunocytochemistry/immunofluorescence). Cells were PFA fixed and blocked with 3% BSA for 30 minutes at 24°C. The primary antibody (1/200 in 1%BSA in PBS) was incubated with the sample for 16 hours at 4°C. An Alexa Fluor® 488-conjugated goat anti-mouse IgG polyclonal (1/300) was used as the secondary. Publishing research using ab30350? Please let us know so that we can cite the reference in this datasheet. Thank you for contacting us. In general, the immunoglobulin class (IgG1, IgG2a, IgGM, etc.) and light chain sub-class (kappa or lambda) is listed on the online datasheet. When the light chain is not listed, then the light chain sub-class has not been determined. In these instances, it is probably that the light chain sub-class is kappa, given that murine serum immunoglobulins are 95% kappa and 5% lambda, as discussed in the reference at the following link: http://www.ncbi.nlm.nih.gov/pubmed/3116408 Mol Immunol. 1987 Jul;24(7):751-7. PMID:3116408 Of the antibodies your customer has enquired about, The light chain sub-class has been determined for three: ab90960, ab86896, and ab1385. All are kappa light chain. I hope this information is helpful to you. Please do not hesitate to contact us if you need any more advice or information. I have used ab30350 in the past and it worked well in ICC. The current lot, GR30681-1 does not stain cell as expected. The previous lot stained the plasma membrane but the current lot stains the nucleus, which is not where CD24 is expressed. I am staining the same samples as before. I am sorry this product did not perform as stated on the datasheet and for the inconvenience this has caused. As requested, I have issued a free of charge replacement for one vial of ab30350 with the order number 946525. To check the status of the order please contact our Customer Service team and reference this number. Please note that this free of charge replacement vial is also covered by our Abpromise guarantee. Should you still be experiencing difficulties, or if you have any further questions, please do not hesitate to let us know. I wish you the best of luck with your research. We are interested in doing some double immunofluorescent staining of cells for CD44 and CD24. As they are both membrane located we need to go the Fluorescent route. The cells are human and fresh from biopsy samples. There is also a possibility of applying this to FFPE tissue. Can you advise on the best combination of these two Ab's to use? Thank you for your enquiry. We do not have a CD44 antibody that is directly flurophore labelled that has been shown to work by BOTH IHC-Fr and IHC-P. However, we do have the following unconjugated antibody shown to work by both applications: ab23844 CD44 antibody [MAC329] Rat Monoclonal FACS, IHC-Fr, IHC-P, IP. We have the follwing antibodies that are fluorphore conjugated but only shown to work in IHC-Fr: ab19618 CD44 antibody [IM7] Phycoerythrin conjugated Rat Monoclonal FACS, IHC-Fr, IP. ab19622 CD44 antibody [IM7] FITC conjugated Rat Monoclonal FACS, IHC-Fr, IP. With respect to CD24; again we do not have an antibody that has been shown to work by both IHC-P and IHC-Fr. However, we do have directly conjugated antibodies that have been shown to work by IHC-Fr. They are as follows: ab25657 CD24 antibody  FITC conjugated Rat Monoclonal FACS, IHC-Fr, IP ab25281 CD24 antibody  PE/Cy5 conjugated Rat Monoclonal FACS, IHC-Fr, IP ab25646 CD24 antibody  Phycoerythrin conjugated Rat Monoclonal FACS, IHC-Fr, IP I consider your best option using a combination of the rat monoclonal antibodies according to the wavelengths that you can detect with your fluorescence microscope. I hope this information helps, please do not hesitate to contact us if you need any more advice or information.